The appointment of interlocutors, their Kashmir foray, and report to home minister, all seems to be an exercise in haste, to appear engaged as the US president arrives. Ilham Hassan reports. 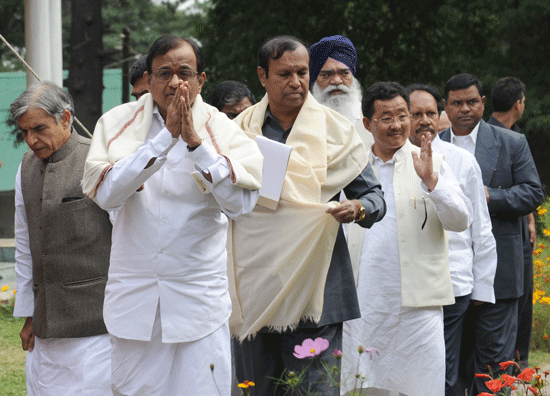 A day after Home Minister P Chidambaram returned from Baramulla, three interlocutors appointed to initiate dialogue process in Jammu and Kashmir called upon him in New Delhi to submit their maiden interim report. The home minister’s arrival in Kashmir and the acceleration in interlocutors’ job were to present to the world the Indian seriousness at resolving Kashmir issue ahead of US President Barack Obama’s visit to India. The contents of interlocutor’s interim report, however, are not known. “Let it be between the government and the interlocutors,” leader of the 3-member panel Dilip Padgaonkar said after submitting the report. He and his colleagues, academician Radha Kumar and former Information Commissioner M M Ansari have been reprimanded for their utterances on Kashmir. Chidambaram asked them not to offer “ball by ball commentary” after their statements on inclusion of Pakistan for finding “permanent solution to Kashmir dispute” and “scope of constitutional amendments to accommodate dialogue on Kashmir” were resented both by the BJP and the Congress. The submission of first interim report is a calculated formality. The secessionists have refused to meet the interlocutors. Significantly, the interlocutors refused to knock at the doors of the separatist leaders (unlike the all-party parliamentary delegation) and wanted them (separatists) to fix appointment “as and when they felt like meeting us”. “We do not have any magic formula other than to keep with our efforts to be engaged with them (separatists). We are hopeful and that is why our second visit will take place in less than a fortnight”, Padgaonkar said. The sustained media campaign on the interlocutor’s engagement in Jammu and Kashmir following their arrival in Srinagar on October 23 created an impression that it is a significant, serious and sustained effort. This is despite the fact that the ground situation is otherwise as the separatists in Kashmir boycotted them and all significant political voices in Jammu other than those associated with the ruling coalition refused to recognize them. However, the government skillfully attained the first objective of creating an impression that it is engaged in a reconciliatory process in Kashmir. This is evident from the hasty appointment of interlocutors. 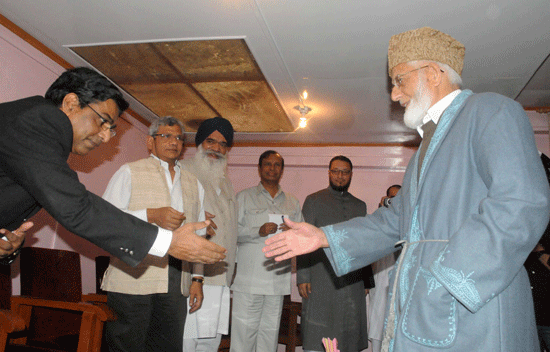 The panel was formed on October 13, it arrived in Srinagar on October 23 and submitted first report on November 2. 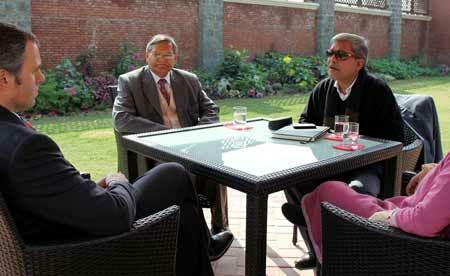 However, the ground situation in Kashmir also went to interlocutor’s favour. Since the arrival of all-party parliamentary delegation in Kashmir on September 20, the situation gradually came in government’s control. For four months, Kashmir Valley was dominated by anti-India protests, which were sought to be quelled by the use of extreme force by the authorities. As 111 civilians died during the uprising and hundreds were injured, many with permanent disabilities, the government was not making any head and tail of the situation. Post, all party delegation visit, the context of focus on Kashmir changed from perpetual violence to political and intellectual activity. The state, which was only speaking through barrel of gun, began to introduce a renewed political discourse. During the past forty days, there was no fresh civilian killing with bullets though two people were beaten to death by police during the period. Meanwhile, Chief Minister Omar Abdullah challenged merger of Jammu and Kashmir with Indian union. Though the separatist-sponsored shutdowns and curfew imposed by the authorities continued to affect normal life, the overall situation began showing signs of normality. However, the situation did not improve to the extent that the Center would find sections of separatists desperate to find a place on the negotiating table. This has happened in the past when Mirwaiz Umar Farooq and Yasin Malik engaged in talks with New Delhi in 2003. This time around, the public resentment against the killings has not subsided completely even when prolonged protest calendars have set in fatigue among the people. In this backdrop, even the pro-dialogue separatists are unlikely to engage with the interlocutors. There are other reasons also responsible for separatists’ refusal to engage with the interlocutors. First, it appeared to them as the Center’s attempt to trivialize the situation as none of the interlocutors has any appeal in Kashmir. Second, the appointment of past interlocutors – KC Pant and NN Vohra – has proved to be futile, aimless and directionless. Third, the interlocutors mandate is unidirectional to engage the people with Government of India. The involvement of Pakistan does not fit in their scheme. A senior separatist leader told Kashmir Life that the central government would highlight this (interlocutor’s) initiative as its serious engagement with people and leadership of embattled Kashmir. And, since the interlocutors have been appointed for one year, they would play their role to neutralize the current unrest. The interlocutors described establishment of peace and order as pre-requisite to initiation of purposeful dialogue. The semantics introduced by the interlocutors like their mission to “find final solution to the Kashmir dispute to the aspirations of people” or “importance of Pakistan” and the “flexibility in Indian Constitution to accommodate dialogue on Kashmir”, were not enough to lure the separatists. To offset the government’s objectives, both factions of Hurriyat Conference announced separate programmes on the arrival of US President. While Geelani led faction announced a Valley-wide “civil curfew” from November 6 to 8 to exhibit Kashmiri people’s resentment against status quo in Kashmir, the Hurriyat faction led by Mirwaiz Farooq initiated a signature campaign in support of efforts for the final resolution of Kashmir issue. The interlocutors would return to Kashmir after a fortnight, precisely after the US President concludes his visit. By the time, Omar Abdullah government would start functioning from winter capital Jammu after the biennial shifting of offices. Whether anyone of significance meets them in “deserted” Srinagar would be interesting to watch.